It was known that Transcend planned on making new CompactFlash cards on a new controller when I worked on the previous part of the flash card tests. The reason was simple: the speed characteristics were always very important for the company and it didn't want to leave the leading position for long. Last summer when I just started the tests, Transcend Ultra 25x was the fastest but the competitors were close on the heels. Then we got the Apacer Photo Sceno Pro with greater read and write speeds. The Ultra 30x was Transcend's response. The speed wasn't lifted considerably, but it was enough to grasp the power once again. At the same time, and it's even more important, it had improved compatibility with many models of digicams. This card became the best choice for demanding users for a pretty long period. For the 30x cards the company changed only the sticker leaving the same card design. But the growth to 45x looks much more significant (50% against 20%), and now one would hardly confuse the new cards with the old ones even in color. As you can see, we tested a 1GB card. 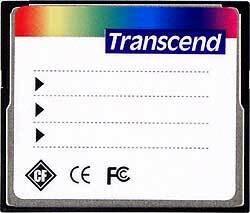 Transcend also offers twice smaller and twice greater cards (in size), with the production volume of the 512MB model being the lowest. A couple of gigabytes is cool but the price is also pretty high. The card makers started a race for volume, and I must say that it's not just volume increase, - they do it to the detriment of the most popular card sizes. I hope our readers can afford 1GB and maybe even 2MB cards without selling their property :). Or at least, 512 MB cards will be supplied in greater quantities. So, we tested the card in the 6-in-1 IEEE1394 connected to the FireWire controller on the SB Audigy under the Windows XP Pro Rus SP1 with the HD Tach 2.61. Such test system was used in the last two parts of the flash card tests. I also wanted to include this card into the third part, but it's not finished yet as other new solutions appear irregularly, while Transcend's 45x card is already available. Apart from the overall situation on the market we'll also estimate how faster this card is compared to the old one. The access time is even a little greater, and I can't say it looks perfect in comparison with the rest. However, the access time doesn't exceed 1.5 ms for all modern GF cards, which is incomparable to the Microdrive or the like, and the difference lower than 1 ms is not critical in most cases. Also, this is the first card that reaches 5 MB/s in writing. The breakaway is not great, but in this case every 50 KB/s can be determining (like it was last time). 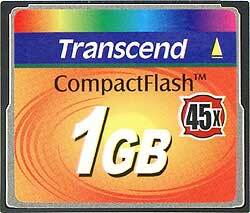 The new Transcend outpaces the former leader by 200 KB/s which is a pure victory. As compared to the previous solution, the growth is over 20% - it's farther from promised 50% even more but... In some other spheres new models can be equal in speed or even slower than the old models, and in the sector of flash cards the speeds grow up all the time. They grow either gradually like in case of the CompactFlash or stepwise like in case of the SD. Well, Transcend demonstrated its power once again. From time to time its cards lose the leading position as the other companies do not dawdle either, but every new iteration makes it a leader once again. This time the picture is the same - I don't see any competitors for the Ultra 45x, and even if they soon come onto the scene owners of the new cards won't be losers.